Château Lafite Rothschild is a wine estate in France, owned by members of the Rothschild family since the 19th century. The name Lafite comes from the surname of the La Fite family. Lafite was one of four wine-producing Châteaux of Bordeaux originally awarded First Growth status in the 1855 Classification, which was based on recent prices. Since then, it has been a consistent producer of one of the world's most expensive red wines. Situated in the wine-producing village of Pauillac in the Médoc region to the north-west of Bordeaux, the estate was the property of Gombaud de Lafite in 1234. In the 17th century, the property of Château Lafite was purchased by the Ségur family, including the 16th century manor house that still stands. Although vines almost certainly already existed on the site, around 1680, Jacques de Ségur planted the majority of the vineyard. In the early 18th century, Nicolas-Alexandre, marquis de Ségur refined the wine-making techniques of the estate, and introduced his wines to the upper echelons of European society. Before long he was known as the "Wine Prince", and the wine of Château Lafite called "The King's Wine" thanks to the influential support of the Maréchal de Richelieu. Towards the end of the 18th century, Lafite's reputation was assured and even Thomas Jefferson visited the estate and became a lifelong customer. Following the French Revolution, the period known as Reign of Terror led to the execution of Nicolas Pierre de Pichard on 30 June 1794, bringing an end to the Ségur family's ownership of the estate which became public property. In 1797 the vineyards were sold to a group of Dutch merchants. The first half of the 19th century saw Lafite in the hands of the Vanlerberghe family and the wine improved more, including the great vintages of 1795, 1798 and 1818. On 8 August 1868, the Château was purchased by Baron James Mayer Rothschild for 4.4 million francs, and the estate became Château Lafite Rothschild. Rothschild, however, died just three months after purchasing Lafite. The estate then became the joint property of his three sons: Alphonse, Gustave, and Edmond Rothschild. The 20th century has seen periods of success and difficulty, coping with post-phylloxera vines, and two world wars. During the Second World War the Château was occupied by the German army, and suffered heavily from plundering of its cellars. Succeeding his uncle Élie de Rothschild, Lafite has been under the direction of Éric de Rothschild since 1974. 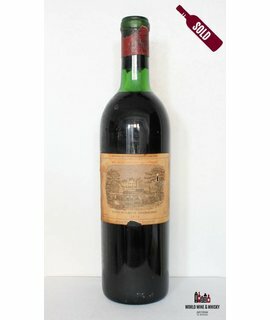 The record price at auction for a bottle of wine ($156,000) was for a 1787 Château Lafite which was once thought to be owned by Thomas Jefferson. The authenticity of the bottle, however, has been challenged. Recently the 2008 vintage produced a worldwide increase in price of over 125% in six months from release, which in turn has come to push some Asian countries to the top of the list of worldwide markets in which investment grade wine is purchased. 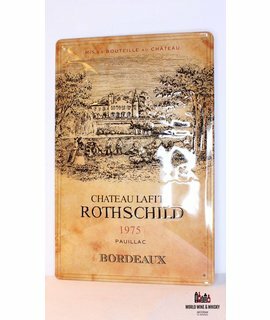 In early November 2012, police in the city of Wenzhou, China seized nearly 10,000 bottles of Châteaux Lafite Rothschild, but they suspected the stash of wine was counterfeit. Lafite is very popular among China's nouveau riche, but analysts suspect that between 50 and 70 percent of Château Lafite Rothschild in China is fake. If genuine, this particular collection would have been worth up to $16 million (US).